Please note that ages listed are a guideline and not a restriction. There is a 25% reduction in tuition for the second (or more) child in the same family or the second class. There is a $36 annual registration fee for classes. 18 months to 3 years of age. 30 minutes, once per week. $50.00 per five-week term. Girls and boys. Fitness, developmental motor learning and exploratory movement with very limited gymnastics skills introduced. Class is set up and supervised by the instructor, however, parents work directly with the child. Includes use of pre-school sized bars, beams, rings, ropes, inclines, barrels, tunnels, bouncers, foam shapes, inflatables and the largest foam-filled play pit around! At various points in your child’s development in this class, they will crawl, walk, run, jump, hop, skip, leap, roll, bounce, balance, swing, climb and much, much more, in a setting designed to be safe and exciting time after time! 3 to 5 years of age. 45 minutes, once per week. $80.00 per five-week term. Girls and boys. 7 to 1 student to teacher ratio. A beginning pre-school class for first-time, or novice tots. Fitness and developmentally oriented with introductory gymnastics skills. Children will experience introductory gymnastics skills on pre-school sized gymnastics equipment, including balance beams, parallel bars, trampolines, tumbling mats and more, presented in a fun and exciting setting! Emphasis is placed on improving fitness levels to allow for the safe learning of skills/developmental progressions. 3 to 5 years of age. 45 minutes, once per week. $80.00 per fie-week term. Girls and boys. 7 to 1 student to teacher ratio. Pre-school class for the experienced child that has been recommended by the instructor to advance from Tot One or who has been through the Tot I class for two or more terms. 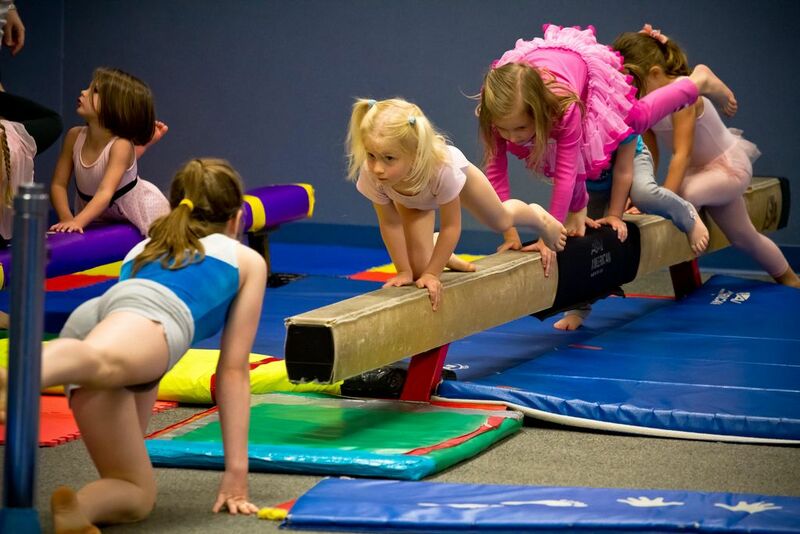 Children will experience developmental gymnastics skills such as rolls, supports, cartwheels, swings, balances and jumps utilizing pre-school gymnastics equipment including balance beams, parallel bars, trampolines, tumbling mats and more. Continued emphasis on improving fitness levels for the safe learning of skills/developmental progressions. 5 years old and up. 1 hour, once per week. $85.00 per five-week term. Girls and boys. 8 to 1 student to teacher ratio. A gymnastics skills-oriented class for the novice or beginner child. Children will be introduced to basic gymnastics skills on all Olympic gymnastics events. Basic vaulting, bars, beam, floor and trampoline skills will be introduced in a fun and challenging manner. Emphasis is also placed on improving fitness levels to allow for the safe learning of skills and developmental progressions. 5 years old and up. 1 hour, once per week. $85.00 per five-week term. Girls and boys. 8 to 1 student to teacher ratio. A gymnastics skills-oriented class for the experienced or recommended beginner. Children will be challenged to improve upon and learn variations and combinations of basic skills on all Olympic gymnastics events, including trampoline. Emphasis is also placed on improving fitness levels to allow for the safe learning of skills and developmental progressions. 7 years old and up. 1 hour and 15 minutes, once per week. $90.00 per five-week term. Girls only. 9 to 1 student to teacher ratio. An introductory class to the intermediate level. Children will be introduced to basic intermediate level skills on all Olympic gymnastics events, including trampoline. Emphasis is also placed on improving fitness levels to allow for the safe learning of skills and developmental progressions. Entry criteria: kick to handstand, fall to “bridge” position and “hold”. 7 years old and up. 1 hour and 15 minutes, once per week. $90.00 per five-week term. Girls only. 9 to 1 student to teacher ratio. Children will be challenged to improve upon and learn variations and combinations of basic intermediate skills. Also stressed at this level are “walkover” and “handspring” elements. Emphasis is also placed on improving fitness levels to allow for the safe learning of skills and developmental progressions. Entry criteria: front and back “walkovers” and “limbers”. 7 years old and up. 1 hour, once per week. $85.00 per five-week term. Boys only. 9 to 1 student to teacher ratio. Children will be introduced to basic intermediate level skills on all men’s Olympic gymnastics events, including trampoline. Also stressed at this level are “walkover” and “handspring” elements. Emphasis is also placed on improving fitness levels to allow for the safe learning of skills and developmental progressions. Entry criteria: kick to handstand, fall to “bridge” position and “hold”. 7 years old and up. 1 hour and 15 minutes, once per week. $90.00 per five-week term. Boys only. 9 to 1 student to teacher ratio. Children will be challenged to improve upon variations and combinations of intermediate skills on all men’s Olympic gymnastics events while learning newer advanced skills. Dynamic forward and backward handspring skills stressed at this level. Emphasis is also placed on improving fitness levels to allow for the safe learning of skills and developmental progressions. Entry criteria: front and back “walkovers” and “limbers”. 10 years old and up. 1 hour and 30 minutes, once per week. $95.00 per five-week term. Girls only. 9 to 1 student to teacher ratio. Children will be introduced to advanced level skills on all Olympic gymnastics events, including trampoline. Dynamic forward and backward handspring skills stressed at this level. Emphasis is also placed on improving fitness levels to allow for the safe learning of skills and developmental progressions. Entry criteria: standing or round-off back handsprings with very little help from instructor. 10 years old and up. 1 hour and 30 minutes, once per week. $95.00 per five-week term. Girls only. 9 to 1 student to teacher ratio. Children will be challenged to improve upon and learn variations and combinations of advanced skills on all Olympic events, including trampoline. Dynamic handspring and somersaulting skills stressed at this level. Emphasis is also placed on improving fitness levels to allow for the safe learning of skills and developmental progressions. Entry criteria: round-off back handspring. A "tumbling only" class for the student that needs anything from beginner to advanced tumbling skills. This class includes basic rolls and cartwheels, to walkovers, round-offs, handsprings and somersaults. Skills are geared to the student's individual needs. Trampolines will be used for some tumbling drills and skills. Emphasis is also placed on improving fitness levels to allow for the safe learning of skills and developmental progressions. 7 years old and up. 1 hour, once per week. $85.00 per five-week term. 9 to 1 student to teacher ratio. These classes are highly recommended for cheerleaders needing extra help with their cheer tumbling skills. The Open Gym is only available to students currently enrolled in regular classes. The "Open Gym" is offered for that extra time desired in the gym in a less structured setting. The student can work on the specific skills she or he wishes to concentrate on that evening with the help of our instructor. 5 years olds and up. $10 per child. Virginia International Gymnastics Schools, Inc.